What a difference a year makes. These two photos are almost exactly one year a part; both taken at a pumpkin patch; both in overalls. I really wanted to try and recreate the original photo as much as possible to get a good sense of just how much has changed between 6 months and 18 months. Looking at this is just surreal. We didn't go to the same pumpkin patch but we still had a great time choosing our pumpkins this year. Brandon really loved walking around all of the pumpkins and tried picking all of the up. Daddy finally found a little one that Brandon fell in love with and he carried that pumpkin around with him the rest of the day. This pumpkin patch was at a Methodist Church that was much closer to our home than the last year's patch and it had a wonderful supply of pumpkins to choose from. I wish I would have been able to get better photos but with a toddler running around like crazy I spent more time chasing him then anything else. That's fine though because I know he had a blast. 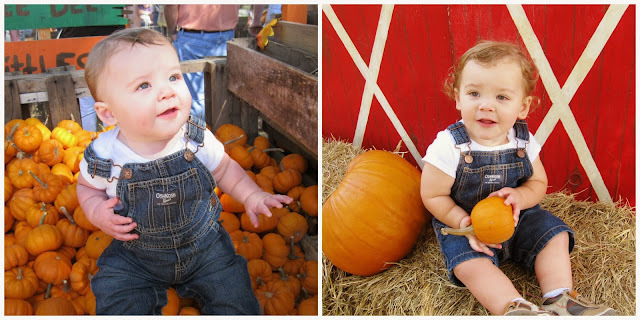 This just goes to show how different this year was from last because last year we just went strictly just to get some photos of Brandon as the pumpkin patch where as this year we actually went with the intention to pick out pumpkins to carve. I was very excited as I had never carved a pumpkin before myself.